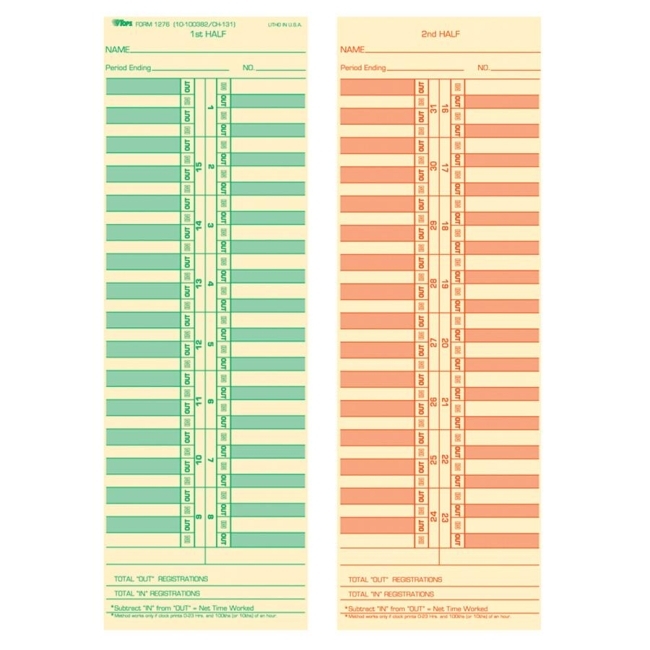 Time cards feature semimonthly format and numbered days with first half of month on front in green ink and second half of month on back in red ink. Screened in and out boxes provide a quick way to check of hours worked. Total "out" and "in" registration lines to give net time worked. Extra-heavy material is made of 150 lb. manila stock. 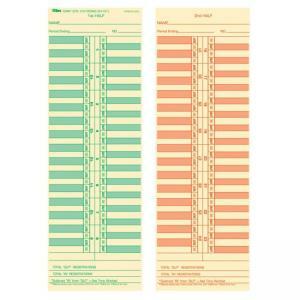 Time card replaces 100372, 10-100382, CH131, L34B, 1950-9360 and is designed for use with Acroprint 125R, 150R, ES700, ESP180, 175TR; Amano 1000, 10000; Lathem 2100, 4000, 5000E, 1000E; Simplex KCF, KCG, JCG, JCP and 2500.